So Hurricane Sandy came and went. We got lucky: no flooded basement, no trees falling on our car, didn’t even lose power. We invited some friends who live closer to the sea and were evacuated, but in the end biggest problems the storm meant to us was a closed daycare, a restless toddler, and some extra yard work. 1. Have an indoor alternative to playgrounds. When my son can’t go outside to run for more than a day, he is a were-toddler. One minute he’ll be an adorable child, pulling books from the shelf and reading, or taking the broom out of my hands and sweeping the kitchen floor. The next minute the pent-up energy transforms him into a monster-toddler, who climbs on tables, pulls the cat’s tail, and pulls down A HUNDRED books from the bookcase. a) child-safe indoor playground in the basement, complete with toddler-sized swing, slide, tunnel, and baby gates. Cost: several hundred dollars, and my dyeing pots. Not now. b) The Providence Children’s Museum. The best indoor playground I’ve ever seen. 2. Those cherished few hours after kids’ bedtime and before parents’ time to sleep? Even more precious when the whole family’s been home the whole day. 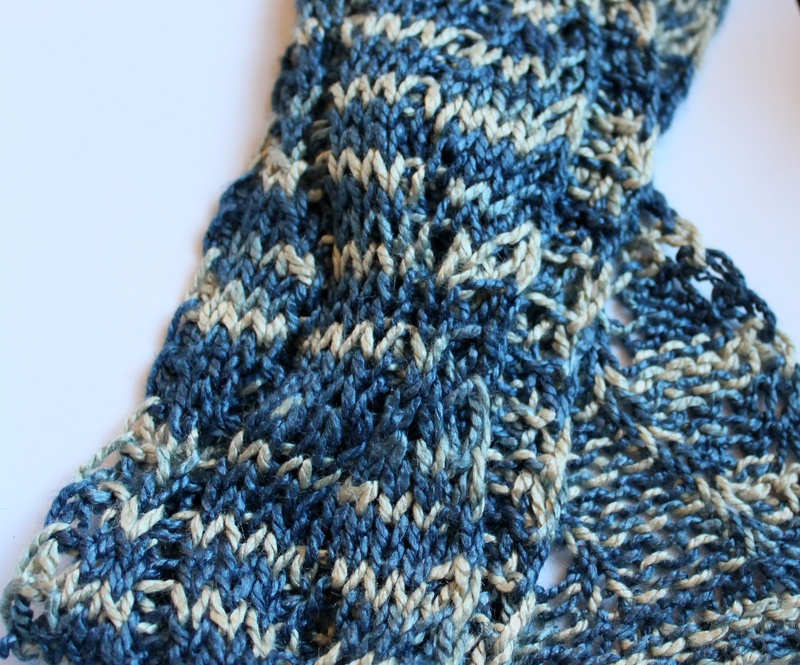 This is when I knit, dye, read, blog, have grown-up conversations, and lately, design. Now this is a totally new endeavor to me, and I have to admit that writing down even a simple pattern in clear instructions so that others can use it is a lot harder than just knitting for myself … and I never would have expected it to be such a thrill! I feel exhilarated after each design session, as if I’ve just ran a … well, more than I usually do. I have always tweaked and modified designs to make them do exactly what I want, but since several of you asked if I have designs specially made for my yarns, I got started on knitting up some projects in indigo-dyed silk and am in the process of sharing the patterns. One is here on Ravelry and in pdf. Next up: Spun Silk necklace and a lace scarf in Raw Silk. 3. Whatever the weather throws at you, try to enjoy at least some aspect of it. Above mentioned toddler, when he was done pulling the house apart, stood in awe at the door for twenty minutes, with the front door open and the storm door closed, and just watching the rain. Totally fascinated. He hardly ever concentrates on anything for more than 2 minutes, but the look on his face just watching and watching Sandy was just priceless.